The most appealing part of a pigeon's face is the eye. From the time people started to breed pigeons, much has been said and written about the subject of the eye. And the opinions have differed widely, often contradicting each other. Today there is still a wide range of views around. We find them in our own country as well as in foreign magazines. Quite a few authors hold onto the opinion that all that's to be read in a pigeon's eye is it's physical condition. Others, (especially English) claim that by looking at a pigeon's eye they are able to discover the most incredible things. In this article I'm going to describe for you those factors which are most essential when judging the eye. My knowledge comes from studying the international pigeon literature, as well as from 20 years of intensive, personal observations during my career as a fancier, and I believe it to be accurate. "Magic Blue Turbo" won as a yearling the 1th National from Chateauroux 650 km with 8 minutes ahead in a field of 5523 birds. 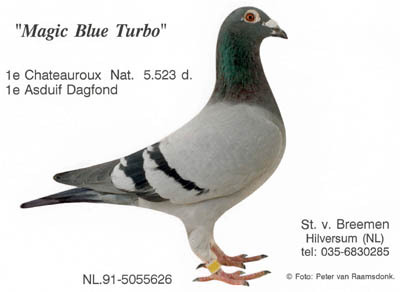 He is the son of the golden pair "De Goede Jaarling"(also won 1th National Chateauroux but against 8500 birds and 18 minutes ahead) and "Het Schoon Blauw". This pair produces worldwide National winners and Ace pigeons in 5 generations. This is real breeding power! When you are evaluating a pigeon's eye, of importance are: the size of the pupil, the richness in color, the surface area of the iris and it's pigmentation, the overall expression in the eye, and the "Vermeyen-ring." The size of the pupil is related to the nervous system and to the bird's willpower. Watch out for those pigeons who have large pupils. An increase in the size of the pupil means a decrease in the ability of such a bird to finish difficult, non-stop races, races in which much is being asked of the birds. They haven't got enough "fighting spirit" and without that they aren't able to achieve much. As long as I've been keeping pigeons, I've never seen champion birds with large pupils. On the shorter distance pigeon stock the size of the pupil is not of as much importance because here the pigeons aren't forced to use up the last bit of reserve strength left in their bodies. Piet de Weerd once made the following, very truthful observation: "we aren't interested in small pupils as such, but in the factors coursing them to be small. As these are closely related to willpower." I've never held a pigeon in my hand and not looked it deep and intense in the eye. This long standing experience has taught me to be cautious of pigeons who's pupils react fast to changes in light. I'm looking for pigeons with pupils that, even in semi darkness, are smaller than those of other birds. I don't agree with the much published opinion that in good quality pigeons the pupils react quite noticeable to light and dark. On the other hand, pigeons with pupils that do not change at all under different lighting conditions, but always stay the same size, to me are absolutely useless for breeding as well as for racing. I'm not going so far as to say that exceptions aren't possible, once in a while they do happen, but the ratio is less than 1 of 500, so gambling on that is not something I would recommend. Race after race, the birds with no expression in their eyes disappear until finally in the biggest races only the birds with the richly colored, clear eyes are left. Also, when you visit the nation wide exhibitions you'll find birds with non-descript eyes among the speed pigeons, but never will you find them among the matadors! When asking some of the big names in the pigeon sport their opinion; men as Jan Aerts, Piet de Weerd and John Lambrechts, the response is always that they like full color. That's also what I look for in pigeons, because I share their opinion, an opinion which is based on years of intensive research. When judging the quality of a pigeon, the next important measuring scale is the color of the iris. The iris is the colored ring between the pupil and the cornea. Sometimes you may notice a thin, black ring which separates the iris from the cornea. The ring has been named after Louis Vermeyen: the Vermeyen ring, and it is very noticeable in the younger birds. It has never been sufficiently proven if a pallid or a vividly colored eye is either good or bad. But I've never disguised my opinion: I prefer a richly colored eye. The color of the eye and the richness of that color depend upon pigmentation. Of course, I'm not saying that everything is subject to eye color, but good color is a positive sign. 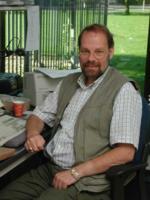 The German author W. Scheer writes: "It is always of considerable interest to observe the pigeons in their baskets. At the first race you'll find all types of eyes. But slowly as the races get more difficult the less colored eyes disappear." For years I've always taken every opportunity offered to examine the very best pigeons and I've concluded, contrary to what others say or write; good quality pigeons always have eyes that are exceptionally rich in color. It doesn't matter if within the iris different colors are well divided or not. Neither is it important, or is it desired that the colors are present in regular rings. The iris may show all different color variations as long as the colors are deep, starting from the very inner circumference up to the outside border. What I really appreciate are eyes with many colors blended together as if an artist took all the leftover paint on his palette and painted the iris with it. I read this illustration somewhere and thought it to be very fitting. A few of my pigeons who looked as this were "De Oude Kapoen"(son of "De Kapoen" of Desmet-Matthijs) and "De 08 Duif" of Jan van Erp. Both of them produced such wonderful off-spring, even when mated together; I'm sure that for many years to come these will bring me much satisfaction. Pigeons who have white eyes, speckled with colorless grains of pigment can be just as valuable as those who have yellow or brown eyes. Then there are those pigeons who's eyes have little pigment or none at all. They appear to be completely black. Eyes like that belonged to the world famous "Jonge Stier", a pigeon who made his boss André Van Bruane a legend in a very short time. As I have stated before, the color of the eye is mostly the result of pigmentation. To have plenty of pigment is a positive characteristic. We prefer our pigeons to have full, deep colored eyes. Besides the color of the eye, an even more valuable tool for judging the performance possibilities in a pigeon is the blood supply to the eye. This is because it is closely related to the components which determine the abilities to achieve and this again allows you to draw certain conclusions which are relative to the general characteristics of a certain pigeon. The first one to do research on this subject were Dorn and Cohrs. By way of tissue analysis, they concluded that small grains of pigment, laying closely together, and filmy thin supple cell tissue, are characteristic for the outside surface of the iris. An uncountable amount of microscopic size capillaries are found among those and the usually seem to conglome-rate in the outer zone of the iris. Laying closely together they find themselves a way to the surface between the grains of pigment making the surface of the iris appear a little granular. When you inspect a pigeon's eye in direct sunlight, pointing the beak towards the sun, it is possible to detect this phenomenon with your bare eyes. The rougher the surface of this iris appears, the more capillaries will be present in the eye, which again points to a pigeon with a better blood supply. The granulation of the surface of the iris should be of an even thickness, starting at the inner edge beside the pupil, up to the outer edge. For years, I've noticed this to be the case in the majority of my own superstars and I've detected it also in the favorites in the other lofts. Without any hesitation I would say that at least 80% of all the top class pigeons have completely granulated eyes, while no more than 20% of very good pigeons have eyes with a lesser granular surface. I feel urged to add a cautious note to the previous paragraph: in the pigeon sport you will never find absolute truths. A pigeon will never become a first class bird if wonderful eyes are his only feature, or willpower, or muscle quality. Rather, a good pigeon has to rate exceptionally high on at least five or six of the most important characteristics. While selecting his birds, a realistic fancier prefers to make sure of a sign that offers him a four times larger chance of success. Only in exceptional cases will he trust signs which are less promising. One of the reasons for this is that often there is not enough room in the loft. When considering pigeons with large pupils, you only have, a one half of one percent, chance of success. While eyes without color, or not enough granulation give you no more than a 20% chance. We are always bound by the limited amount of space available in our lofts, which means we can't keep every pigeon. Common sense tells us that to have the best possible chance of being successful in the future, we should only keep pigeons with characteristics that have a positive effect on the ability to achieve. Besides the granular surface of the iris, the red color in the eye is another indication of an ample blood supply to the eye. The red color in the eye isn't caused by pigmentation, but comes from the very thin capillaries that force themselves to the surface of the iris by pushing aside the grains of pigment and giving the yellow ones a reddish tint. It's no more than logical, that the coloring of the eye, the granulation and the blood supply, shouldn't only be found in the thin layer on the outer surface of the eye. They should be present throughout the entire colored section of the eye. The rate of blood supply to the eyes, which we measure by looking at the granulation and the amount of red color, is extremely important because it gives us a clear indication of how the blood supply is to the rest of the body. When the blood supply to the eye is excellent, it is very unlikely that it is inadequate to the other parts of the body. One of the basic elements needed for the ability to achieve is: vitality. Vitality in a pigeon, in a way, is similar to the bird being in top form. Pigeons, with much vitality, will year after year, day after day, look the same as an ordinary racing pigeon does when it is in top condition. To obtain high ratings in vitality and general condition a pigeon's body needs a blood supply that is consistently higher than that of the average bird. An increase in blood supply improves the form, a decrease does the opposite. Therefore, it is safe to state that the important ingredient in pigeons which are consistently high in vitality, is their excellent blood supply system. When we are able to conclude from granulation and the color of the eyes that an above average blood supply is present, we can at the same time assume that this is true for the rest of the bird's body. Such pigeons give us a much better than average chance to succeed. It sometimes happens, for a certain period of time, the color of the eyes may fade significantly in pigeons who either are under stress, or who recently had to perform a strenuous task. The sparkle disappears, showing that the entire organism is over tired, and as a consequence, the blood supply has dwindled down to the bare minimum. Pigeons, who have as a characteristic a poor blood supply system, are unable to perform well, except when they race the easy, short distance races. These are races in which they don't have to draw from their reserves. Many pigeons, with poorly colored eyes, are found among one of the world most famous, strongly inbred 'speediness' the Janssen-pigeons. This is possible because in general, fanciers in the Janssen pigeons home ground, Europe, basked these birds only for races of 100 to 200 miles. The important factors for these distances are speed, the mordant or fighting spirit, and intelligence. Since these races usually last no longer than two to four hours, the characteristics of endurance and long term performance capacity, matters which are closely connected to the blood supply, play no significant role. Something we haven't discussed, as of earlier is the 'servile-lance' ring. The 'surveillance', or circle of correlation(eye-sign) is a colorless, or black, semi or whole circle, located directly between the iris and the pupil. In the past, as well as in the present, there are fanciers who consider the size, and the shape, of this circle to be of the utmost importance. These same fanciers claim to be able to draw the most fantastic conclusions from this circle of correlation. At the same time, there are also fanciers who consider this circle to be of no importance at all. There is a general consensus among the most re-renowned fanciers in Belgium and Holland that pigeons with a complete correlation or 'surveillance' circle are better suited for breeding than for racing, and it would be advisable for every fancier to have a few of these birds in their loft. For over 25 years, I have kept records of all the important features of my pigeons. I've made a list of the names of all my pigeons who had a complete correlation ring. I've kept up-to-date with the breeding- and racing values of these birds over a long period of time, and have come to the conclusion that many of my better racers and breeders are in the possession of a complete and wide correlation circle. However, among my favorites there are also many who show only a partial correlation circle, or none at all. Among those with a complete circle are many good racers, but they are less convincing as breeders. And there were even those who were completely useless. From all this I've come to the conclusion that the correlation circle isn't that important, neither for racing, nor for breeding. And that makes sense! Because you wouldn't expect that something as important as the ability to achieve, which in itself again depends on so many different factors, would make itself known in such a small and insignificant sign as this circle. Maybe, all this will be of some consolation to all the fanciers who have but a limited knowledge of how important characteristics are genetically transmitted. Another, characteristic of a racing pigeon's eye is the so-called 'Vermeyen ring'. Vermeyen of Antwerp, was one of the Belgium grand masters of the pigeon sport, and he was the first one to call attention to the ring. The Vermeyen ring is a small black ring, separating the colored part of the eye from the cornea, which has no color. The best way to observe this ring is by looking at the eyes of young, dark eyed pigeons, while holding them in the light. In mature pigeons the intensity of the ring's color is one of the best measuring tools for determine form. A close to perfect system of blood supply results in birds that easily reach top form. At the same time this perfect blood supply system makes the Vermeyen ring change from it's normal gray color to a deeper black. The color of the ring becomes a reliable aid in evaluating the overall condition of the pigeon during the entire racing season. In conclusion, here is one more feature of the eyes: when we look a pigeon straight in the face with our eye level, parallel to the bird's beak, we can see both eyes fully. When the eyes and the face together give you the impression of an owl's face, most often you're dealing with some of the smartest pigeons in the loft. And I challenge you to test this feature for accuracy in your own loft.